Description: Wish they'd cut these weeds down. Description: North bound CSX train on the UP. Description: Q676 heading for Abbeville, SC at the south end of Lawrenceville. Description: Heading onto the NS at Butler St. Description: CSX 5105 leads two older GE's into the yard at Florence, S.C. 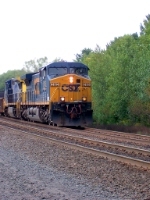 Description: CSX 7904 leads train Q494 north at Lake City, S.C. Description: Route 206, 1444 hours. 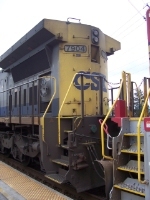 Description: CSX C40-8W 7904 trails on S282 North. Description: CSX train Q685 off the Fitzgerald sub approaches Rice Junction in Waycross. Description: Q164 eastbound from Willard.